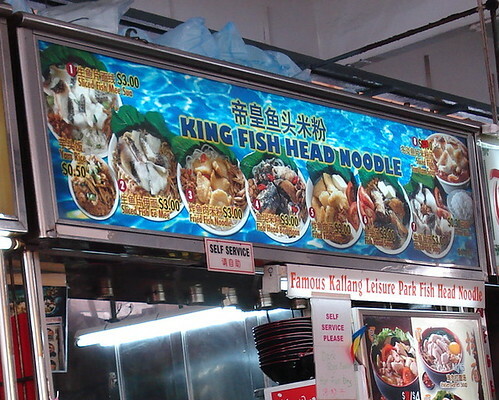 King Fish Head Noodle, originally uploaded by Camemberu. I never believed this Marine Parade Food Centre stall was really famous (despite its "Famous Kallang Leisure Park Fish Head Noodle" claim). But apparently it got featured on TV. I noted quite warily that it has also branched out into doing ramen and other noodles. Spreading itself a little thin or was there a truly skilled cook behind the counter? Only one way to find out. 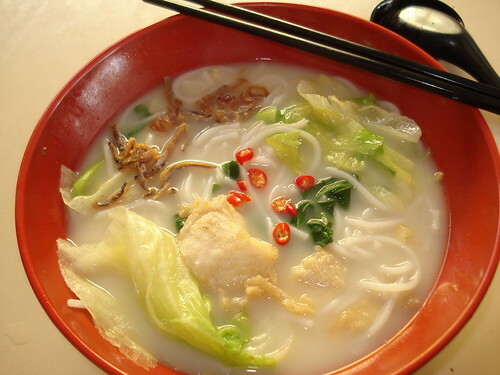 Fried Fish Noodle Soup, originally uploaded by Camemberu. I went for some fried fish noodle soup with thick beehoon. It came in a large ramen-style bowl in mock lacquer (red and black melamine). My first whiff of the soup gave me a frown. It smelt like boiled rice or beehoon water. And didn't look far from it. Pale, sickly and wan. I dredged up the submerged lettuce and tossed in some red sliced chili to add some colour. The taste? OK, slightly better than it looked, and it grows on you slowly but it's still very light. Sort of the food you'd want when you're feeling under the weather (think bland porridge). Pity they gave such a measly portion of the fried ikan bilis. I really needed more. The fish too was not very tasty, either not very fresh or well-fried. Oh well, I won't need to try this in future anymore. Heh thanks. Haven't tried that one yet. Actually my favourite is still the Blanco Court Fried Fish Noodles at China Square. Love the fried egg they add! Can also request for fried fish eggs too!